Asianet has played a key role in giving opportunity for many vibrant youngsters to showcase their talents through various reality shows. Music, comedy and dance reality shows have leveraged the young people to make use of the right opening properly. Star Singer is one among the program which has give life to many singers. 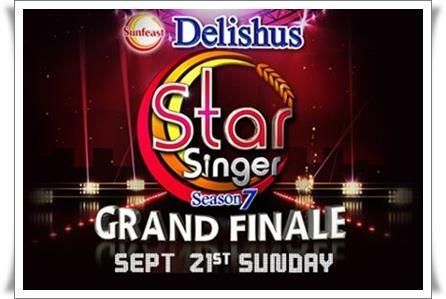 After delivering unlimited fun with music and entertainment for the last 6 months, the 7th edition of Sunfeast Delishus Star Singer is coming to the close. Star Singer being the most popular Music show on malyalam television will conclude with the grand finale which is being scheduled to conduct on 21st September 2014. The show which was launched on 31st March 2014 with 17 participants is at the most important juncture with 7 contestants competing for the title. After several rounds of performance and elimination, 7 best singers of the current season are Aslam, Malavika, Manusankar, Janaki, Vaisakhi, Varsha Krishnan and Reshma Ragavendra. While assessing the acts performed by the final 7, it is very difficult to make a judgment as all the contestants give their best performance on the stage. The grand finale will be held before a crowd and invited guests. Starting at 6 PM, the final will be a 4 hours of mega show creamed with songs, dance and humour at its best. The final show will be hosted by Rimi Tomy while MG Sreekumar and Anuradha Sreeram would stay as the judges. Asianet would telecast the grand finale right from the star till the declaration of the winner. Viewers can enjoy the performance of their favourite singers along with breath taking dances enacted by celebrities. Star Singer during the years had set the platform for budding singers to reach their talent beyond continents. It gave change for several youngsters to perform stage shows conducted in different countries. Even, the stage gave rare chances for them to sing in movies and also establish as playback singers. The winner will be given an apartment worth Rs.40 lakh.